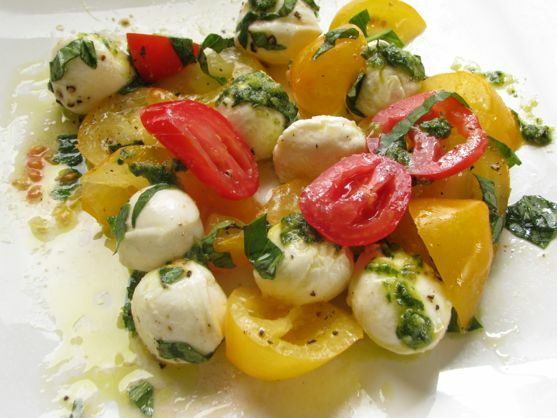 I am intrigued with the simplicity and popularity of insalata Caprese. Everyone seems to love it, especially Mr. ST. If it’s on the menu, he orders it, no matter what, no matter where. I often say I like “bright, clean” food, which may seem vague, without a frame of reference. This is a perfect example of bright and clean, and part of the experience is taking a mellow food like fresh mozzarella and pairing it with the ripest, sweetest seasonal tomatoes (clean), and brightening it up with basil, olive oil and salt. I chose yellow tomatoes because they were available at my local farmer’s market. We do eat with our yes and I think the yellow tomatoes bring a beautiful punch of golden color, and they tasted so good, they should only be eaten in their purest form to throughly enjoy. Yes, there are some differences between yellow tomatoes and red ones. 1. Fresh tomatoes left sitting on counter, not refrigerated. 2. Fresh mozzarella, not the yellow rubbery stuff sealed in plastic. 3. Young, fruity, extra virgin olive oil. 4. Sea salt, freshly ground black pepper. 5. Fresh herb, traditionally basil, (although as you can see below, dried herbs are also acceptable. Notice that I do not use vinegar on my caprese. I’ve had caprese salad with vinegar in some very good restaurants, but I stand by my “no vinegar” rule. I especially think that a dark balsamic does not do the mozzarella or the tomato well. If you absolutely think you need the acid, use a white balsamic or champagne vinegar (sparingly). There is not much of a recipe here, but there are rules to making a caprese salad. I say this because I have been served very good caprese salads and then again some very bad ones. The two unforgettable caprese salads come from Rada Chianti, Italy (pictured below) and Bistro Jeanty in Yountville, California which prepared their insalata caprese with local heirlooms. Both good enough to make lasting food memories that set the standard. Caprese salad is typically mozzarella and tomatoes doused with a fruity olive oil, and garnished with fresh herbs, usually basil. It’s very simple, yet when properly prepared, it is elegant. Conversely, when improperly prepared, it can be a disaster. During my wine country visit, I had the BEST at (Bistro Jeanty) and the WORST tomato salad served to me within a 24-hour period. They were relatively the same price, and both places had access to the same growers and condiments. The losing dish had tomatoes that were very mushy and tasteless. Tomatoes can sustain chilling injury below 41 degrees F, and will lose their flavor and turn mushy and as I wrote in this post, tomatoes should never be refrigerated. The tomatoes were drenched in a balsamic vinegar, so much so that they were blackened, and there was no salt or pepper. This demonstrates how important it is to understand the ingredients and how they must work together, especially in simple dishes. Other terrible experiences with insalata caprese include a plate full of raw onions with tomato and cheese, and an overpowering use of garlic. 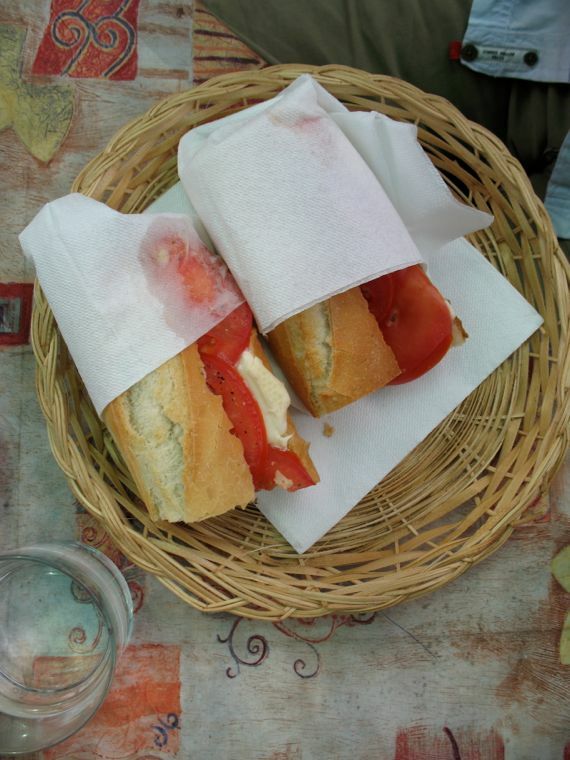 This is my all time favorite caprese salad, eaten as a sandwich in a cafe in Radda Chianti, Italy. The dish on the right is a caprese sandwich from same cafe. Notice here that dry herbs were used, which is perfectly acceptable. In this dish, the cheese was the main star, the tomatoes were sweet and perfectly ripe, complimented by the saltiness of the olives. This sandwhich was served to us in Tuscany cafe. Mr. ST still talks about it. 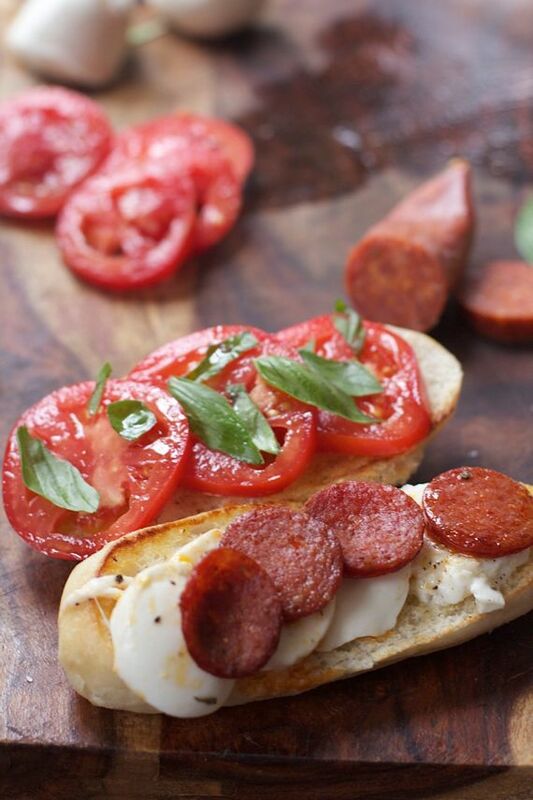 Here is one of my versions of a stellar caprese sandwich made with fried pepperoni. How to make a caprese salad the way they do it in Italy. Layer mozzarella tomatoes. Drizzle with olive oil. Mozzarella: You can use small or larger size mozzarella. If using larger sized, slice. Don’t use the store bought, packaged mozzarella. Mozzarella used to always be made from water buffalo milk, known as di bufala. That is generally too expensive to use and has been replaced by cow’s milk. 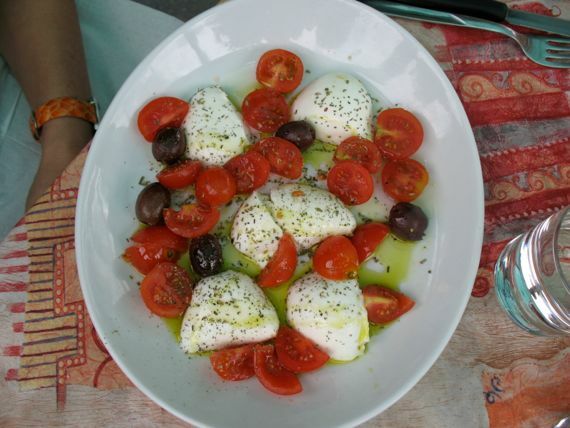 However, do treat yourself to mozzarella di bufala, as it is much creamier. Tomatoes: You can use any good tomatoes. I used roma tomatoes. My two favorites were made with cherry and heirloom respectively. The important thing is that they are fresh, ripe and sweet. Olive Oil: It will matter. This is a recipe that calls for your best finishing oil. Basil: I use fresh Italian sweet basil from my garden that is flavorful. This is just yet another super flavorful way to enjoy insalata caprese. It would be outstanding for a insalata caprese sandwich on a crusty baguette. Mix first four ingredients in mini food processor until pine nuts are incorporated, but not necessarily completely smooth. Add basil and pulse until incorporated. This particular pesto has texture. Drizzle over insalata caprese.